Last year I have been on holiday to Edinburgh, Scotland. So I knew a bit of the history about Mary the Queen of Scots. And I was wondering if this series is based on real facts, is it historical true? Sadly it is not historical accurate. It is a costume drama of fiction and a bit of fantasy. So what is exactly true and what is not…I dare not say. The first season is about Mary Queen of Scots fleeing to French court somewhere in Paris – no it is not Versailles – and preparing to marry Francis the Dauphin of France. This first season is about alliances, friendships, love, intrigues, the threat of war, power, nobelty and of course how to reign. Everybody is trying to find out how to do that best in his / her own environment and in his / her own way. The episodes differ a bit from one to another. There are many plot changes and unsuspected events or habits that appear. The middles episodes of the whole season are becoming cruel so it is not suited for underaged children to watch. Especially when you do not know if such scenes are historically correct. Or is it fantasized cruelty? Makes me shiver and I do not know if I will completely watch the second season. And how about the Scottish accents? Mary Queen of Scots and her four ladies named lady Aylee, lady Greer, lady Kenna and lady Lola. Great actresses but who speaks really Scottish? It is not a Scottish production but a mixture of all kinds of English accents. I love the history of the ‘Great British Castles‘ which is also a series with lots of historical facts presented by Dan Jones. The castle chosen for this series is ‘Ashford Castle’ in Count Mayo, Ireland. 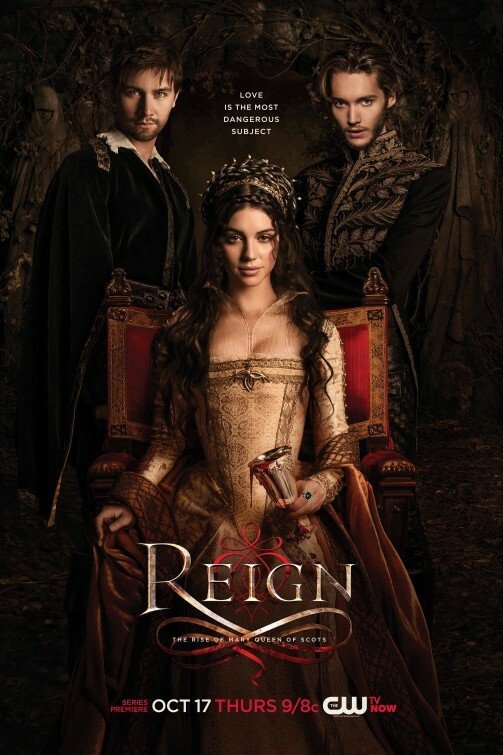 So in short I am not sure if I really like the series Reign because of the historical facts and the quick turnarounds in the episodes. I love the costumes though and the choice of crew and the diversity of day and night scenes and festivities. I hope you like the series. It is worth to try watch it! I am not telling too much about the story – never do in my reviews – you have to see the series yourself and make your own opinion.